Bayer is paying a whopping $400m upfront to gain partial rights to two targeted cancer drugs in development at US biotech Loxo Oncology. The treatments are larotrectinib - which could be mere weeks away from a US filing after positive phase II data was reported at this year’s American Society of Clinical Oncology (ASCO) meeting - and earlier-stage candidate LOXO-195. Both target tropomyosin receptor kinase (TRK) fusion proteins linked to a range of tumour types. Along with the upfront payment, Bayer is also agreeing to a $450m milestone payment on the approvals of larotrectinib and first commercial sales in certain markets, plus $200m on the same criteria for LOXO-195 and $500m in sales milestones for the drugs which takes the total value of the deal to just over $1.5bn. 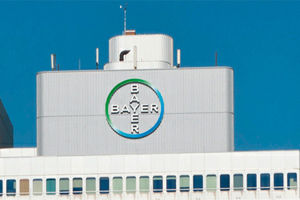 In return Bayer will have rights to the orally-active drugs outside the US as well as co-promotion rights in the US market, and the two companies will split development costs. TRK fusion proteins are formed after one of three TRK genes (A, B and C) fuses to another gene and have been shown to encourage tumours to grow by accelerating cell division. They are seen in a collection of malignancies including colorectal adenocarcinoma, soft tissue sarcoma, infantile fibrosarcoma and cholangiocarcinoma. Loxo is trying to repeat the trick achieved by Merck & Co (known as MSD outside the US and Canada) when it secured approval for PD1 inhibitor Keytruda (pembrolizumab) for all cancers, regardless of location in the body, which carry a specific biomarker. Keytruda’s approval for microsatellite instability-high (MSI-H) tumours was the first granted by the FDA for a molecular indication. In the ASCO trials, larotrectinib achieved a 76% objective response rate in 50 patients - both adults and children - diagnosed with 17 types of TRK fusion protein-positive advanced cancer. The data was sufficiently compelling to encourage Loxo to start talking about an FDA filing before the end of the year or in early 2018, and Bayer says it thinks it can move quickly with an EU filing later in 2018. LOXO-195 seems to have activity in cancers that acquire resistance to larotrectinib, a common problem with highly-targeted cancer drugs as tumours develop ways to bypass the targeted pathways. “We see great potential in larotrectinib and moreover the follow-on compound LOXO-195 which has the potential to provide additional benefit for patients who might progress on an initial TRK inhibition therapy,” said Bayer’s head of oncology Robert LaCaze.